At Last! A Line to Golconda! 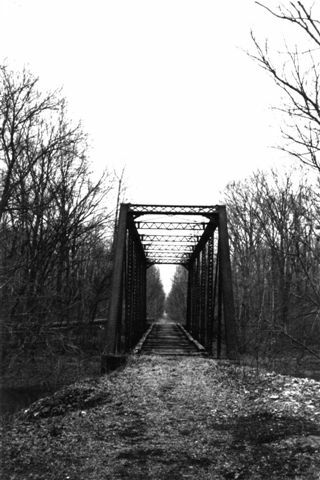 At 3:30 on Wednesday afternoon, December 10, 1902, track was finally completed on the branch-line of the Illinois Central Railroad to Main Street in Golconda. This line started in Reevesville in Johnson County, branching off to the east from the north-south IC line that ran from Paducah to Carbondale and on northward. It curved off just east of the bluff atop of which the Reevesville cemetery is located. The Golconda Herald-Enterprise reported that at least 1000 people were gathered in Golconda to watch the passenger train with a number of the road’s officials on board as it rolled into town. When those men met with the Golconda city officials that afternoon, they agreed on a schedule to become effective on Dec. 21, for two trains each way daily. They would carry passengers and freight. The bridge crew would start work the next day on a bridge across Lusk Creek. The steel bridge had just been sitting there at Reevesville waiting a ride to Golconda. Now it could get there. It was an exciting day for Pope County folks. Many people had waited 15 years or more to bring this service to Golconda. Finally the Ohio River & St. Louis Railroad was organized at Golconda in 1892, and officers and directors started securing right-of-way for the new railroad. Then in 1897 they made efforts to persuade the Illinois Central to finish the road, and in 1901, the railway company agreed to build it, providing the local company would “provide the right-of-way, depot grounds, terminal facilities and a cash donation of $25,000”. So…$25,000 in city bonds were allocated and $4370.00 was donated. Then they needed only $630.00 and a few parcels of right-of-way. Several men agreed to get this done. One of the men instrumental in the project from the 1889’s was Simon Barger a State Representative from Eddyville. There were many others, mostly from Pope and Saline counties, who worked long and hard to get this accomplished. The general foreman of the construction gang was a young native of Anna named John Jeremiah Pelly. Mr. Pelly rose from track-hand to eventually become president of the New York, New Haven and Hartford Line, and even became head of the Association of American Railroads…one of the most powerful men in railroading in the United States. He was married to a young Golconda woman. Mr. Pelly once wrote in a Railroad Man’s magazine about his first effort on construction of the branch line. His boss sent him and said, “Johnny, I’m giving you an ‘executive opportunity’. I want you to be general foreman of the construction gang and build this railroad form Reevesville to Golconda. Do you think you can do it?” John said he was sure he could do it. Until…he drove over to Reevesville and found a strike had exploded right in his face. There were no laborers to be found…and he had a deadline to meet. Or the company would forfeit the right-of-way and that big bonus the hopeful Pope County folks had raised. Railroad track scales were built in 1916 and it wasn’t until after World War I that 11 more miles of track was laid on to Rosiclare, so the fluorspar from mines over there could be brought out by rail. As late as the summer of 1936, there were 85 carloads of fluorspar that passed through Reevesville in one month. There were stations at Brownfield and Renshaw, which was early-on called Dixon Springs Station. A couple of miles east of Renshaw was a station called “Justice”, and a boxcar was used as a depot. Lillian Robinson wrote about living near Dixon Springs and said in her memory, (we don’t know how far back her memory extended) the train ran from Reevesville to Golconda three times a day and the fare was 25 cents one way. Unfortunately, there just wasn’t enough commerce between the towns by the 1980’s and in March, 1983, the Illinois Commerce Commission granted permission to abandon the spur. The tracks were ripped from the roadbed, all 27 miles from Reevesville through Golconda to Rosiclare, and the railroad in Pope County was no more.